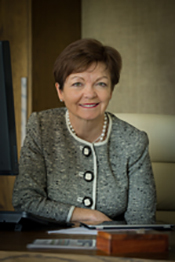 Professor Jane den Hollander has been Vice-Chancellor and President of Deakin University since July, 2010. At Deakin, Professor den Hollander has introduced LIVE the future, an aspiration for Deakin to drive the digital frontier in higher education, harnessing the power, opportunity and reach of new and emerging technologies in all that it does. Professor den Hollander holds a BSc (Honours) First Class in Zoology and a Master of Science degree from Wits University, Johannesburg. Her PhD is from the University of Wales, Cardiff. Professor den Hollander is currently a board member of Universities Australia, Education Australia Limited, and UniSuper, a member of the Advisory Board of the Office of Learning and Teaching, and a trustee of the Geelong Performing Arts Council. From 2005-2008, Professor den Hollander was a Board member of Graduate Careers Australia, and from 2008-2011 on the Board of the Australian Learning and Teaching Council.